Latin novus for new; from Middle English angliae for England. Humpback Whales Silver Banks from Sally Bartel on Vimeo. Visit Whale Store for Humpback Whale gifts. Whale songs heard on recordings or movies are usually the beautiful, haunting sounds of the humpback whale (click here to hear an example). A humpback can sing its long, complicated songs and go back and start anew without any break, singing continuously. Other whales make sounds, but only the humpback "sings." Why the humpback sings is a mystery. Is it a mating device, whereby the male with the longest and most complex song (or "best" song) is the most attractive to females? And why do they change their songs? We can hypothesize that it is an oral history, a form of play, a group bonding device, or possibly a way to pass on new information or rehash old. We may never know. For sometime, it was believed that only males sang, but that has not been totally supported. One whale scientist has observed what appears to be a female singing. The female was accompanied by a calf which appeared to be nursing and the observer noted release of a puff of milk into the water. He did not see a male in the vicinity. Also unknown is how humpbacks make their sounds. They are the kind of sounds normally created in an air medium. But when a humpback sings, no air is released. Of all the large whale species, humpbacks are the most animated and acrobatic. They are slow swimmers, but they get up enough speed to leap clear of the water, executing spectacular breaches. Another feature of these amazing whales is their long pectoral flippers which are almost one third of their body length, the longest of any whale. Humpbacks will lie on the water's surface and raise one flipper into the air and slap it . These flippers can be seen on the ocean from miles away. The name humpback comes from the appearance of a hump on the whale's back when it flexes sharply before diving. Humpbacks frequently raise their flukes when beginning a long dive. This has enabled whale researchers to photograph and identify individual humpbacks from the color and marking of the underside of their flukes. Flukes are categorized much like a photo negative (how much white or black is exposed), the pattern it presents, and the scalloped edges. Humpback whales are black or gray, with white regions of varying degree on their throat and belly. Their flippers are white underneath and sometimes white on top as well. They have from 260 to 400 baleen plates on each side and the baleen are generally all black, with black or olive black bristles. Females - up to 16m long; Males - 15m long. 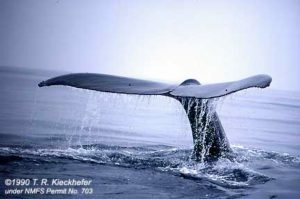 In all species of baleen whales, the females are larger. Females reach sexual maturity at 11.4 to 12.4 m; males at 11 to 12m. Females normally give birth at intervals of two or more years and gestation last 12 months at which time they give birth to a single calf. The body of humpbacks is robust, but the head is surprisingly slim and covered with fleshy knobs or protuberances, which are also found on the lower jaw. These protuberances each hold a single hair. Feeding: humpback whales have a most unusual feeding technique called bubble feeding or bubble netting. The whales circle a school of fish from below and expel bubbles to create a bubble curtain as they ascend. The fish or plankton are confined with the bubble net and the whales charge through it with their mouths agape, ingesting the prey. Enemies: man, of course, has been the most ferocious of enemies, almost wiping out the species. Humpback whales tend to congregate near coasts. Thus, they were easily accessible to shore-based whalers and were severely depleted. Even with complete protection since 1964, the humpback whales' recovery has been almost nonexistent. Of perhaps 15,000 humpbacks in existence at the onset of mechanized commercial whaling in the North Pacific, fewer than 1,000 now survive. In the southern oceans, there were close to 100,000 humpbacks in the 19th Century; today there are approximately 2,500. The future of the humpback is still uncertain. Researchers are cautiously optimistic that the population could recover if left completely unhunted. However, impacts on the whale's habitat and food supply are ongoing problems. For decades, the gray whale has been credited with the longest marine mammal migration. Every winter though, humpback whales travel from the Antarctic to the northern tropics to find warm water in which to raise their young, researchers have discovered. The migration is the longest for any mammal ever recorded. Researchers from Cascadia Research Collective in Olympia, Washington, U.S. photographed the tails of humpbacks wintering off the Caribbean coast of Costa Rica. Since the tail pattern of each humpback is different, they identified seven of the same animals after they had returned to the Antarctic. One mother and calf made the 8300-kilometer (5160-mile) trip in 161 days. They also recorded sea-surface temperatures, using satellite data, for the sites where humpbacks spent the winter. “Wintering areas occur where waters with temperatures between 21°C and 28°C are found,” says Kristin Rasmussen of the Cascadia Research Collective. Gray whales travel from Mexico to the Arctic, estimated at about 7600 km (4700 miles). “However, no individual gray whale has been documented traveling the full extent of their migratory range, and it's possible that no gray whales actually make the entire migration,” says Rasmussen. Only humpbacks have been documented making the full trip. Humpback whale populations in the North Pacific Ocean have increased according to a study funded primarily by National Oceanic and Atmospheric Administration (NOAA), an agency of the U.S. Commerce Department. This study was conducted by over 400 whale researchers throughout the Pacific region. While some populations have grown since federal protections in the 1960s and ‘70s, isolated populations, mainly in the western Pacific Ocean, have not recovered and show low numbers. The overall population of humpbacks reveals approximately 18,000 to 20,000 whales. In 1966, when international whaling was banned, the population of humpback whales in the North Pacific was estimated at less than 1,500. At least half of these whales migrate between Alaska and Hawaii. SPLASH (Structure of Populations, Levels of Abundance and Status of Humpbacks) authored the report. The research was an international effort that involved more than 50 organizations. Begun in 2004, the study determined whale migratory patterns and estimated population sizes by using a library of 18,000 photographs of whale flukes used to identify 8,000 individual whales. Central coordinator for the SPLASH project was Cascadia Research in Olympia, Washington. They matched whale fluke photographs from their feeding grounds with photographs from their wintering area. In this way, they were able to determine the individual whales from their patterns, as well as their movements, and estimates of the sizes of different populations. Researchers also collected more than 6,000 biopsy samples for studies of genetics and population. The photographs will also be studied to determine how levels of scarring from line entanglement and ship strikes vary among regions. These samples, which have not yet been analyzed, should provide important clues into the humpbacks’ intricate population structure and current threats to its recovery. The baby humpback whale named Colin was euthanised August 21, 2008. Separated from his mother, he was first seen on August 17 in the waters on the northern side of Sydney. The Australian National Parks and Wildlife Officers and the Water Police began to monitor him. They all hoped that his mother would return. When this did not happen, Colin began to try and feed from the hull of several boats. A decision was made to attempt to lure the young whale out to deeper water in an effort to locate his mother. Colin disappeared in the open water and the rescue boat turned around. The following morning Colin was back. People from all over the world offered their suggestions as to the feeding and care of Colin. Funds were offered to keep him alive. Save The Whales received numerous emails and phone calls from people distraught over the baby whose only real hope for survival was to locate his mother. Two baleen whale babies in history had successfully been kept alive and they were gray whales. J.J. was captured by SeaWorld San Diego when she was only days old. Lifeguards found her floundering in the surf off Los Angeles' Marina del Rey on Jan. 11, 1997. She was malnourished, dehydrated, and undersized at 13 feet, 10 inches, and weighed only 1,670 pounds. Her ribs showed through her skin and her umbilical cord was still attached. At SeaWorld, she was feed through a two-inch diameter tube inserted into her mouth. Marine biologists nursed her with a simulation of mother's milk, a formula of cream, vitamins and pureed fish. She grew to 30 feet and 18,000 pounds. Too large for confinement, she was released into the Pacific Ocean. One of the problems with a lost whale calf is that moving it into captivity would be very stressful and could harm or even kill the animal, depending on its health. Save The Whales contacted U.S. marine mammal rescue groups (or groups that move large marine animals), the Marine Mammal Center in CA, the Monterey Bay Aquarium (MBA) in CA, and SeaWorld San Diego. We only talked to one person and that was at the MBA. To save Colin, there would have to be an aquarium or facility in Australia where he could be confined and fed. The agency in Australia that was in charge of Colin is the Department of Environment and Climate Change (NSW). An Australian contact was able to get through on the phone and told them that Save The Whales would be willing to offer funds to help feed the baby whale. They asked our contact what formula to feed him, and Save The Whales emailed a formula for baby cetaceans. ORRCA (Australian marine mammal research and rescue organization) reported that a conference was planned to discuss Colin’s best chance of long-term survival. Before that occurred, however, his condition deteriorated rapidly. He was unable to swim strongly and he began to lie motionless and lethargic in the water. Veterinarians were shocked at his weakened condition. Authorities, after much consultation, decided to end his misery, complying with the Cruelty to Animals Act. Veterinarians did what they had to do to end Colin’s suffering. Despite reports to the contrary, according to ORRCA, it was quick and controlled. His body was taken to Taronga Zoo for necropsy. Save The Whales thanks Tom Kieckhefer, a marine biologist/educator - Save The Whale, for finding the formula for feeding baby whales and dolphins sent to Australia. He was involved in the rescue of a young baby humpback in Hawaii more 27 years ago. The baby was stranded at Punalu'u. It was captured and taken to Sea Life Park where it was fed and nurtured for eight days before succumbing to pneumonia. We are grateful for the help of Australian songwriter Vincent Ruello who lives in Sydney. He was our phone contact when we could not get through on the busy phone lines. Vinny offered the assistance of Save The Whales in the form of funds and the whale milk formula forwarded to the National Parks staff. Whales need help because of ship strikes, pollution, habitat destruction, noise pollution, overfishing, climate change and whaling. Sign petitions, write letters and get involved with government decision-making agencies. The wayward humpback mother Delta and calf Dawn have presumably returned to the Pacific Ocean after they turned into the Sacramento River from San Francisco Bay. For two weeks beginning May 12, 2007, an international public followed their journey while veterinarians, marine biologists and scientists used all their tricks to get them turned around and headed in the right direction. Both whales had injuries caused by a boat and there were grave concerns that they could be re-injured in the busy river traffic, as they traveled 90 miles inland up the Sacramento River. No biologist can explain why the duo swam up the river which just underscores how little we really know about these magnificent whales. There is some speculation that the two might have been exploring new territory and were not really “lost.” Jim Darling, a biologist in British Columbia, has studied humpbacks near Hawaii since the mid-1970s. He believes that our understanding of any kind of whale behavior is very limited. Darling said that although people assumed the whales were lost, “… we don’t think we know whether they’re in there for some reason.” How humpback whales navigate, where they travel, what their body language means -- even how many members of this endangered species remain and how long they live -- are part of the mystery enshrouding the creatures, said Darling. Save The Whales’ marine biologist Tom Kieckhefer worked with the rescuers, as he had participated in a similar situation with the wayward humpback Humphrey who swam up the Sacramento River in 1985. After Humphrey returned to the Pacific, he was sighted in 1986, 1987 and 1989, but has not been seen since 1990. It is hypothesized that he suffered neurological damage (possibly from a boat) which caused his disorientation and irregular breathing habits. Kieckhefer states that it could have been a ship/boat strike that disoriented the mother and daughter, domoic acid (a toxic diatom bloom) that got the mother narced (or intoxicated) and led them astray, or an unknown reason. Some have speculated that Delta/Dawn and Humphrey went up into the river because of their wounds, perhaps in an effort to heal. The rescue team tried various methods of reorienting Delta and her daughter by playing underwater sounds of humpbacks feeding with sea lions, a killer whale attacking gray whales, and by banging metal pipes underwater. Fire hoses were sprayed about 300 yards in front of the whales in an effort to get them turned around. Major concerns were that they would have a boat collision or swim up a small inlet where they could become trapped in the mud. Acoustical and herding techniques did not yield the hoped-for results. Concerns grew that the longer they stayed in fresh water, the worse their wounds would become. For two days, over Memorial Day weekend as the rescue team took a break, mother and daughter traveled the farthest, each time traveling about 25 miles in approximately six hours. They seem to prefer swimming against the current. 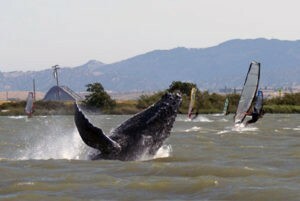 The whales themselves made the ultimate decision to turn back to San Francisco Bay. A 500-yard safety zone around them was enforced by the Coast Guard. Being able to observe the whales up close for several days gave researchers an unprecedented opportunity. "A number of firsts were made during this operation," said Dr. Frances Gulland, Director of Veterinary Science at The Marine Mammal Center in Sausalito, California, head veterinarian for the rescue team. "This was the first time antibiotics have been administered to free swimming whales in the wild.” The antibiotics include enrofloxacin (trade name "Baytril"), donated by Bayer Animal Health Care, and ceftiofur trade name "Excede"), donated by Pfizer Animal Health. A whale-appropriate Baytril dosage was prepared by Grandpa's Compounding Pharmacy, Placerville, CA. The antibiotic injections were considered necessary because of the whales’ long exposure to fresh water and the fact that Delta’s skin condition was worsening. Dr. Gulland said, “The antibiotics will help the animals fight infections and enhance their recovery from the wounds they sustained from a vessel collision." The antibiotics were administered by a gun which fired a blank cartridge, which in turn propelled a 12 inch long, 3/4” metal syringe. Dawn was treated with one dose of 57 cc, about the equal of two shot glasses. Delta was given two injections in the morning and a third in the afternoon, which equaled approximately six shot glasses. Michael Moore, a scientist with the Woods Hole Oceanographic Institute in Massachusetts, said the whales showed no obvious signs of stress or pain from the injections. The syringes were designed to pull out and drop away after a period of time, without harm to the whales. From DNA testing done through biopsy samples, it was learned that both whales are from the Eastern North Pacific stock of humpbacks (or California feeding population) and that the calf is a female. Dawn was nicknamed before her gender was definitely known. This humpback population numbers about 1,500 individuals, and they routinely travel waters off the Golden Gate. The mitochondrial DNA marker in the California feeding population is virtually absent from the British Columbia and South East Alaska feeding populations. Therefore the duo are not lost members of the British Columbia feeding herd. Humphrey was also part of the California feeding population. Jay Barlow, a National Oceanic and Atmospheric Administration (NOAA) marine biologist, was driving the boat when the skin scrapings were taken. He said, "We're fortunate because the California-Oregon whales are different genetically from the British Columbia whales." He said further skin testing could help researchers understand how long whales can survive in fresh water. The scrapings were taken at several points during the whales’ travels throughout the Delta. “One of the main things to come out of this event might be the reaction of the animals’ skin to fresh water," Barlow said. 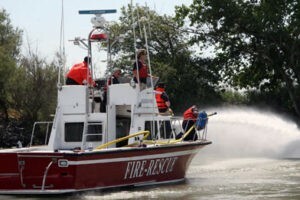 "We did notice that pretty quickly after they hit some somewhat brackish water, near Benicia, their condition improved." Biologists said saltier water, where the duo circled for sometime, helped some of the health problems. Lesions appeared to be sloughing off, and a coating of algae that was adhering to the mother upriver was falling away. Barlow said it was likely that one of the duo will be spotted within five years because researchers keep a catalog of photos of whale flukes, or tails, that currently identifies 300 of the 1,500 whales in the group. Researchers took photos of Delta’s and Dawn's flukes that will clearly identify them to future whale spotters, he said. The whales were not tagged because a monitoring device that researchers had planned to use for implant malfunctioned. It was not possible to ascertain if Dawn was nursing. Because of the murky water, no underwater photographs could be taken. Dr. Gulland said she was flooded with well-meaning suggestions from a public that became very caught up in the whales’ welfare. The injuries Delta and Dawn received demonstrate the increasing dangers that marine mammals face from ocean-going vessels, in addition to ocean noise. The Pacific humpback population is making a strong enough comeback that debate may begin within a year to lower its protection status under the federal Endangered Species Act (ESA) from "endangered" to "threatened." A study began in 2004 into humpback numbers involves 300 researchers. It will cover the Eastern Pacific from Alaskan and Russian waters, North America’s west coast as far south as Central America, and west to Hawaii and Japan. It is expected to be completed in the fall of 2008, and an increase is anticipated. Humpbacks were hunted to near extinction in the 20th Century, but the question is whether their increased numbers warrant less protection under the ESA. The research collected will be analyzed for a year before a final report is completed. After that NOAA, who administers the marine portion of the ESA, could recommend a change of status or a non-governmental group could petition for a change. These proceedings could take up to five years. Jay Barlow of NOAA believes that humpbacks are out of immediate risk of extinction, but thinks that there will be resistance if the downlisting efforts proceed. Experts believe that the Eastern humpback is making strong gains, but they disagree about how the population should be protected. 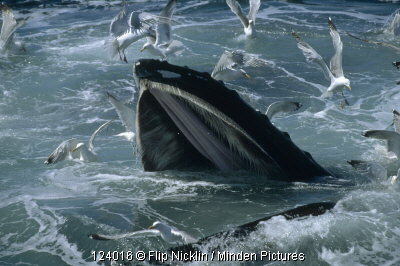 A count of the Eastern humpback population 15 years ago estimated the population at 6,000 to 10,000 whales. This was only 2,000 more than when commercial whaling ceased in 1986. The International Whaling Commission (IWC) estimates the worldwide humpback population to be about 50,000. The number of humpbacks killed legally by aboriginal people from 1986-2006 is 42. Illegally-killed humpbacks have turned up in Japanese markets. DNA tests proved that the whale meat was from humpbacks. Downlisting, it is feared, could lead to more exploitation of the population. Many believe that no protection should be given up if they are vulnerable. In addition to boat collisions, like those suffered by Delta and Dawn, there are numerous other dangers: entanglement in fishing nets, loss of habitat, diminishing food sources and underwater detonations that can destroy their hearing. The saga of Delta and Dawn demonstrates how much the public appreciates the “singing” whales. Save The Whales received numerous inquiries about their status from around the world. It is a mystery why a female humpback whale (Megaptera novaeangliae) swam thousands of miles from the reefs of Brazil to the waters off Madagascar. Researchers believe this is the longest single trip ever undertaken by a mammal - humans excluded. While humpbacks normally migrate along a north-to-south axis to feed and mate, this female decided to check out a new continent thousands of miles to the east. Her journey is more than twice the migratory distance made by humpbacks, and the distance could be even greater if she detoured for feeding purposes. The long-distance swimmer was originally photographed and identified off Brazil in 1999, and subsequently photographed off the African Island of Madagascar. Minimum travel distance between these two locations is greater than 9800 km (6000 miles), which is approximately 4000 km (2486 miles) longer than any previously reported migration. This makes her journey more than twice the typical seasonal migratory distance traveled by this species and the longest documented movement by a mammal. 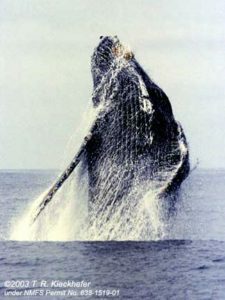 The female humpback was first photographed on August 7,1999 among a group of whales at a breeding ground on Abrolhos Bank off Brazil's southeastern coast. Merely by chance, she was photographed more than two years later by Fred Johansen, a Norwegian on a commercial whale-watching tour off the eastern coast of Madagascar. The flukes of each humpback's tail are distinct, which is why they are used for scientific photo identification. Gale McCullough is a research associate at the College of the Atlantic and regularly searches through humpback photos. Because of the years spent looking at humpback photos, she remembered previously seeing a print of the whale snapped in Madagascar and showed it to scientists. If more long-distance migrating humpbacks are found, it could lead a rethinking of the species' genetic profile and therefore have an impact on conservation. So far scientists have been able to identify seven distinct breeding stocks and several sub-stocks of humpbacks in the Southern Hemisphere. Their perceived isolation and deep-rooted breeding habits raised fears of a restricted gene pool, which is bad news for a species. Marine ecologist, Dr. Peter Stevick of the College of the Atlantic in Bar Harbor, Maine, documented the journey and does not think the humpback was motivated by love, "It may be that this is an extreme example of exploration," he said, "or it could be that the animal got very lost." His study was published in the journal, Biology Letters published by Britain's Royal Society. The paper may be obtained at Royal Society Publishing. Humpback Whale Sea of Cortez Baja from Sally Bartel on Vimeo. This video shows a very active humpback whale that spent 45 minutes near our Palapas Ventana boat, breaching, rolling and spyhopping. Filmed near Cerralvo Island.